As a beginner, reading a Waterfall Chart may be overwhelming – even intimidating – at first glance. In part one of our Waterfall Chart explained series, learn what each bar, line and colour means in a Waterfall Chart and hopefully make your GTmetrix report a little more understandable. Note: This the guide is mostly geared towards the Waterfall Chart seen in GTmetrix – styles, colours and terminology can differ in other Waterfall Charts you may see elsewhere, but the overall concepts outlined here apply to all. The above chart displays the request-by-request loading behaviour of your website. Every script, media file, and/or third-party resource your page requests is displayed here. Why is a Waterfall Chart useful? All of this data aids in debugging performance issues as well as general page issues as a whole. Indeed – there is a lot to take in as a whole, but if you compartmentalize things section by section, it’s not so bad. We’ll start by identifying what each section, line and color means. This is the name of the file or resource that’s being loaded by the web browser. In the Waterfall Chart, it is prefixed by the HTTP method – usually GET or POST (you generally don’t have to worry about this). The first column of the Waterfall Chart lists all the file names requested by your site. Sometimes these can look pretty messy and intimidating. Try not to get too hung up on it. In fact, it probably won’t be necessary that you know what each of these files is. Hovering over the File name will reveal the full path to the file. Ctrl + click to load it in another tab. This is useful if you want to see the exact file that is being referenced. Also, keep your eyes peeled for keywords in the filenames that will help you decipher what they are. You may find a particular plugin being the cause of your performance issues by looking at the file name. For instance, if you’re using WordPress, you might recognize the name of a plugin you’ve installed, or the name of the theme you’re using. The HTTP response status is made up of a status code and an optional human readable message (e.g. 404 Not Found). The response status is returned from the server and tells the browser whether the request was successful or not. Status codes should mostly be 200/200 OK.
Waterfall Charts can quickly reveal request errors in your page. This is where the file is being loaded from. If you’re using a lot of third-party resources (YouTube embed, Facebook widgets, etc) then you’ll see hostnames that aren’t your own. File origins tell you where the resource comes from. If you’re leveraging a Content Delivery Network (CDN), you may see many of your files/resources coming from that one source – which is one way to determine if your CDN is configured properly. Hovering over the file origin name will give you its IP address, which you can use to check if the right IP is being used (eg. if you’re migrating servers or if the hostname resolves to multiple IPs). As the name suggests, this refers to the transferred size of the file or resource. The total combined file size of all your requests make up the Total Page Size. The lower this amount is, the lighter your page is to download (and therefore faster). File size column in the Waterfall Chart. If you see large file sizes (particularly when it comes to images and videos), you should prioritize fixing that issue before going much further into the Waterfall chart. Large file sizes drag out page load times! Have a look at our Image Optimization Guide with regards to optimizing your images for file size. Hover over the size to see transferred size vs compressed size (if it was compressed). 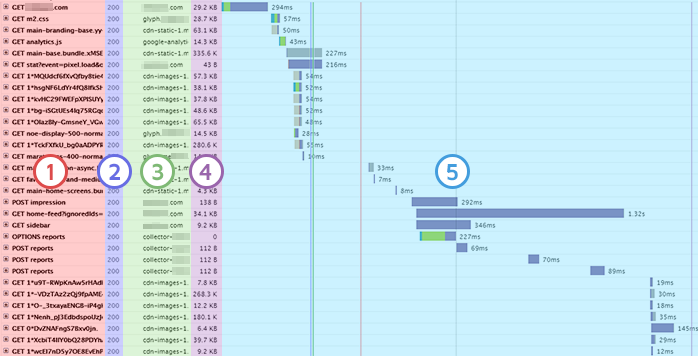 This section is where the Waterfall Chart breaks down the specific duration time required to load each request. This is where you’ll spend most of your time in a Waterfall chart! Load Time Breakdown well represents your page load on a request-by-request level. The pattern of cascading bars represent your page load behaviour – performance issues can be largely diagnosed in this area. We go into this further with Request Timings. Clicking on the request will reveal the Request/Response headers. They contain a wealth of information with regards to how your resources are being served. These are the HTTP headers that the browser sends to the server. For a beginner, there’s nothing generally actionable in the Request headers. Request headers are HTTP headers that the browser sends to the server. One thing to watch for is HTTP/2, which is denoted by lower case request header names and semicolons. These are the HTTP headers that the server sends back as a response, and are sometimes key in diagnosing performance issues. Response headers are HTTP headers that the server sends back to the browser. In basic terms, they denote what configuration, settings, or attributes the request was served with. If GTmetrix reports that you’re scoring poorly on the above recommendations, check your response headers as they will likely reveal details behind why. A simplified view of the Waterfall Chart. You’ll immediately notice that each request has a corresponding set of colored bars to the right. In short, each color represents a different part of the loading process of that particular resource. Let’s breakdown the individual colors and what they represent. Blocking is the time the request spent waiting in the browser’s queue to start the request. Blocking prevents subsequent requests from being processed. Waiting for an available connection (You’ve hit HTTP/1.x’s maximum connections per host, or HTTP/2’s maximum concurrent streams). SSL connection time (normally included in Connection time). HTTP Authentication (the extra request required to set up authentication). Before a connection can be made to the server, the hostname needs to be resolved to an IP – this is the DNS Lookup. DNS lookup time indicates how long it takes to resolve the domain name to an IP address. DNS requests are cached, so DNS Lookup times may differ in subsequent tests – this is why you may see higher DNS lookup times on your very first test. Keep that in mind when comparing Waterfall Charts. This is the time required to form a TCP connection between the server and host/client. Connecting time is how long your server takes to connect to the host/client. Note: SSL connection time is usually included in this time, but is sometimes included in Blocking time. This is the time it takes the browser to send the request to the server. If it’s a PUT or POST request, then this will also include the time spent uploading any data with that request. Sending times are usually not an issue. This is the time spent waiting for the server to generate a response. Waiting time indicates how fast your server responds to a request. There are many reasons why your waiting time may be long. Read more about this here. This is the time it takes for the browser to download the response from the server. Long Receiving bars typically indicate a large file size. 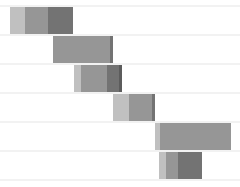 Event lines on the Waterfall Chart. First paint is the moment at which any rendering begins on the web page. This could be showing the logo, loading an image – anything at all that the user could see appear on the page. This is when the Document Model Object (DOM) is deemed ready by the browser. Don’t worry about this one too much – it gets extremely technical, extremely fast. Onload means that the page and all of its constituent elements have finished downloading and being processed by the web browser. Fully loaded means that the Onload event has already fired, and no network activity has occurred for 2 seconds. In a GTmetrix report, a few of these lines are represented in the Timings tab. They’re visualized in a more easy to read format for fast reference. Read more on Advanced Timings here. This article should give you a good understanding of the key elements of a Waterfall Chart. Next in our series, we’ll give you some general tips on how to use them as a tool to assess performance issues. Coming soon! As always, if you have questions, comments, or your own advice to share, we’d love to hear from you! Feel free to tell us your thoughts on Twitter (@gtmetrix) or contact us.